Just when you thought it couldn't get any more bizarre....according to the Associated Press, the F.B.I. knew three weeks in advance that O.J. Simpson planned to retrieve some of his sports memorabilia in Las Vegas. Of course you know how that all worked out. Suffice to say, we were intrigued by this latest wrinkle. Linda Deutsch of the AP and CNN Senior Legal Analyst Jeffrey Toobin will be on the program to sort out what it all means. Meanwhile, we want to hear from you: if Simpson is convicted in connection with the alleged Vegas caper, what punishment should he receive? Weigh in via the comments link below. We'll also share some of your thoughts during tonight's program. See you at 10pm ET. We had such a great response Monday night, we wanted to throw this out there again. If you were president, what would you do? Click on the comments section below and tell us. Custody battle or contract dispute? Randy and Augusta Roman planned on starting a family. Like many other couples, they turned to in vitro fertilization. In 2002, three frozen embryos were fertilized. But on the night before the embryos were to be implanted, Randy had second thoughts, telling Augusta he did not want her to go through the procedure. Their marriage began to crumble. And in December, 2002 they divorced. But who has control over the frozen embryos? Randy wanted them destroyed. Augusta hoped to use them to have children. Their difference of opinion led to lawsuits. But an appellate court reversed the decision, finding that Randy and Augusta signed an agreement with the reproductive center that said the embryos would be discarded in the event of divorce. Now, after the Texas Supreme Court declined to hear the case, Augusta is hoping the U.S. Supreme Court will take the case and rule in her favor. Should a frozen embryo be considered community property, part of a contract, or a life? Rev. Charles Kennedy uses L. Ron Hubbard's book in a sermon. TAMPA, Florida (CNN) -- Some Christian congregations, particularly in lower income, urban areas, are turning to an unlikely source for help -- the Church of Scientology. The Rev. Charles Kennedy, of the Glorious Church of God in Christ, a Pentecostal church in Tampa, Florida, and the Rev. James McLaughlin, of the Wayman Chapel African Methodist Episcopal Church in Houston, Texas, are among the theological hybrids. They say they are not scared off by programs with ties to a church that critics say has aggressive recruiting, secretive ways and rigid theology. As men of God rooted in Christian values, they do not see Scientology as a threat to their faith, but rather as a tool to augment it. "Bishop is a classic western frontier city which survives on tourism. Adding a museum to its community will increase tourism by bringing sightseers and visitors to Bishop year round, benefiting the area economy. If CNN chooses to make a mockery of small town, western heritage, that's its prerogative; but I'm going to remain focused on the economic development of my district. I am a staunch supporter of earmark transparency and accountability. A light needs to be shined on the hundreds of millions of taxpayer dollars spent on 'bridges to nowhere' and projects that serve no real purpose, unlike our community museum request. I do not shy away from, nor do I take any issue with, the public knowing that federal dollars went to support the economic development of a small town on the western edge of the country." Should parents boycott all toys made in China? Are your kids' toys safe? Or could there be lead in them? A scary prospect, indeed. As you know, the focus has been on lead-tainted toys manufactured in China. So, tonight, our question is: should parents boycott all toys made in China? Weigh in below by clicking on the comments section and we'll share some of your thoughts during the show. Also tonight, we're examining the effectiveness of the Consumer Product Safety Commission and criticism of the commission by House Speaker Nancy Pelosi. See you at 10pm ET. "Taxpayers deserve to know how their money is being spent and who is spending it. It's amazing how the 'culture of excess' can change when the public eye is examining the process, so we need an earmark system that is open, honest and laced with scrutiny. For too long, Democrats have been filtering millions into their districts with little to no public attention." Tonight, we answer Congressman McKeon's call for transparency in earmark requests, specifically by questioning his call for a Federal taxpayer-supported museum devoted to ... the mule. Of all the earmark, pork-barrel spending stories we've brought you over this past year, this one is has just galloped to the front of the herd. McKeon wants $50,000 of your money so the town of Bishop, California (pop. 3,575), can explore the possibility of building a mule museum. Of course, you probably already know that Bishop is the self-proclaimed "Mule Capitol of the World," and when the rest of the country is celebrating Memorial Day, the good folks of Bishop are hosting their annual "Mule Days Celebration." McKeon must be so caught up in the spirit of the thing, that he's forgotten that he actually called Democrats wasteful spenders. Of course we wanted to ask Congressman McKeon some questions about this, and, of course, the congressman who says he wants an "earmark system that is open, honest and laced with scrutiny" wouldn't talk to us. To be precise, his taxpayer-supported press secretary wouldn't even return our calls. Tonight on "360," we sit down with House Republican Leader John Boehner. He isn't in charge of Congress, but he is supposed to have some control over his fellow Republicans. Does he think $50,000 for a mule museum is a good idea? We'll ask him tonight, but why don't you let us know your thoughts right now. As of right now we're leading tonight's program with politics --- the race for the presidency, to be precise. We've got some new information from Iowa and New Hampshire. Plus, who's up, who's down, who needs to do what and when....we'll have insight and analysis from our ace political team. And, as always, we want to bring you into the mix via our blog. Tonight we want to know what you would do if you were in the Oval Office. "If I Were President..." -- use that as a starting point. Just click on the comments button below to share your thoughts online. We'll also read some of your comments during the show. That's all for now. See you at 10pm ET. 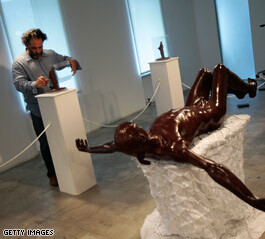 Cosimo Cavallaro uses a brush to touch up one of his controversial sculpture's in his exhibition. His likeness is on watches, mugs, tattoos and dashboards. Some have seen it on the sides of buildings and in assorted pastries. But if you want to get a whole mess of attention about where to put Jesus, nothing beats a bath in chocolate. Call it blasphemy, free speech or a little bit of both, a Canadian artist has finally received the green light to showcase his religious-themed, cacao-inspired art. Titled "Chocolate Saints ... Sweet Jesus", Cosimo Cavallaro's exhibition (which opened this past Saturday) features a life-size, anatomically correct sculpture of Jesus. The shocker is simple: the diety is made out of milk chocolate -- 200 pounds worth. It's the artist's medium of the moment. And it's generating plenty of controversy. A few months back, Cavallaro was assailed in his failed attempt to showcase the chocolate Jesus during Holy Week. The Catholic League called it an assault on Christian sensibilities. That was then. As for now, Cavallaro tells the Associated Press he means no ill will to the Catholic Church, saying, "If my intentions were to offend, if I did do something wrong, I wouldn't be doing this. But I didn't do anything wrong." • What's with Hillary's hypnotic voice?